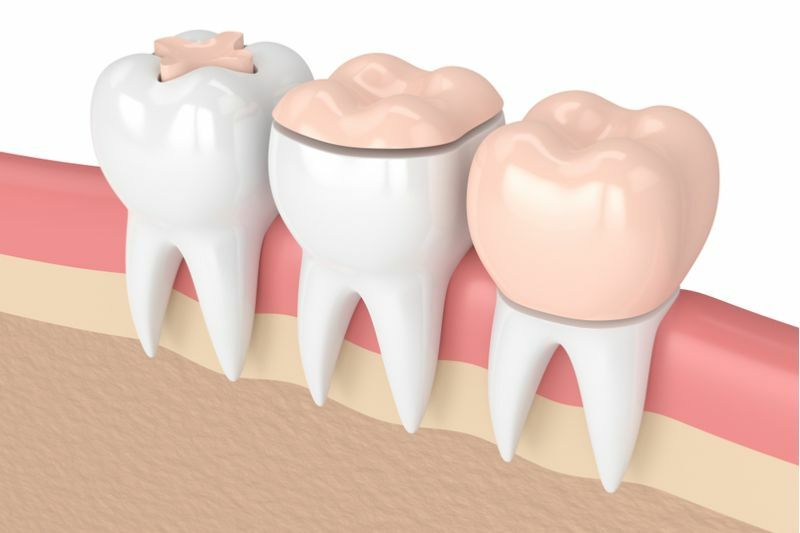 Cavity fillings are the most basic but a highly effective form of dental restoration. They are used to fill holes left after sections of dental decay have been removed from your teeth and in doing so, will prevent bacteria and food debris from becoming lodged in the tooth, causing pain and further dental problems, such as infection, to develop. As such, fillings are very effective. Since they are now also available in tooth-colored resins, which makes them extremely discreet, they are even more popular. In addition to the conventional style of cavity filling that most of us are familiar with, and almost certainly have had at some point in our life, there are two other types that can be used. These are known in inlays and onlays and are used when the filling needed is much larger than usual. Our dentist, Dr. Thomas Young, has extensive experience in the placement of these larger fillings and can offer a complete inlay and onlay service to our patients in and around Fort Worth, TX. Inlays are different to conventional fillings in that they are designed specifically for you and your affected tooth. This means that rather than being applied in one visit, you will need to make at least two to our offices. This is so that Dr. Young can take impressions of your affected tooth which will be used to make your inlay, ensuring that it will fit perfectly. Inlays are designed to cover a large part of the chewing surface of your molars and pre-molars. They can be created from porcelain or composite resin, both of which are tooth-colored and enable the restoration to blend naturally into your teeth. They are also available in gold. When it comes to fitting your inlay, any decay will be removed before the impression is taken. This happens under local anesthetic so that you aren’t in any pain. Then the impressions are taken, and a temporary inlay is placed over the tooth to protect it while your final restoration is being made. Around a week later, you will return to our offices where Dr. Young will check the fit of your custom-designed inlay and then secure it permanently in place. Onlays are a larger version of an inlay, created so that the restoration not only covers the chewing surface of the molars but also covers the cusps of the affected tooth. These are the points on the four corners of each tooth. This ensures the entire top surface of the tooth is covered so that bacteria and food debris can no longer enter it. It also adds strength to the affected tooth. As with inlays, onlays can be created in a variety of different materials. The process to create and fit the onlays is also the same. Benefits of choosing inlays or onlays for your dental restoration? There are various reasons why Dr. Young may recommend that you consider using inlays or onlays to restore your affected tooth. One of the main advantages of choosing inlays or onlays is that very little of the natural tooth needs to be removed in order to fit them, unlike dental crowns which often require the tooth to be filed down significantly for the crown to sit properly. No staining of the natural teeth. Over time, regular amalgam fillings have been found to cause the natural teeth to take on a greyish hue. However, this isn’t the case with inlays and onlays since they are tooth-colored to begin with. Discretion. Your inlays or onlays will be matched as closely as possible to the color of your natural teeth, making them so discreet that no one need ever know you have had your tooth repaired. Add strength to your tooth. Since they are made from durable materials, inlays and onlays can restore strength to a tooth that was previously weakened by decay. An affordable restoration. Inlays and onlays are considerably less expensive than many alternative restorations. If you think that you might benefit from inlays or onlays, or if you have further questions about this type of dental restoration please don’t hesitate to get in touch with our professional, knowledgeable dentistry team to schedule your appointment at our Fort Worth, TX offices today.